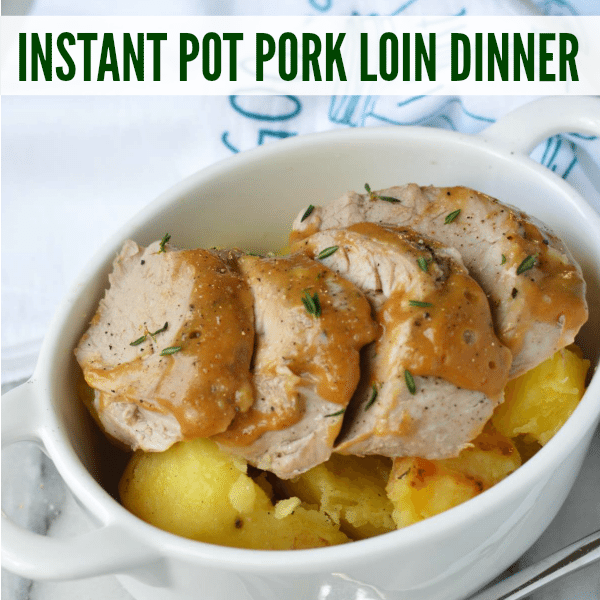 Easy Instant Pot Pork Tenderloin Dinner in minutes not hours! You’ll love this Easy Instant Pot Pork Tenderloin Dinner recipe! It’s a simple and scrumptious dinner you can make any night of the week. PLEASE NOTE – YOU MUST USE PORK TENDERLOIN FOR THIS RECIPE. 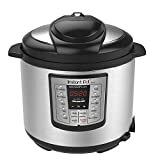 When it comes to cooking meals, you cannot go wrong with an Instant Pot Pressure Cooker . 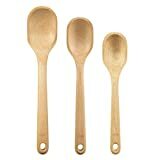 These nifty devices can help you complete a meal faster than almost any other cooking method. For me, there’s almost no meal that’s more comforting than instant pot pork tenderloin . I’ve always made it in a slow cooker with vegetables for an easy weeknight dinner, or as pulled pork for yummy sliders. (You might also like this Slow Cooker Pork and Apples Recipe). 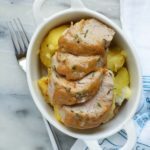 Instant pot pork tenderloin is one of those meals my mom always makes, so it just feels like home. And this recipe tastes heavenly! 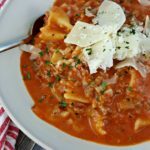 Talk about a one-pot meal, this is about as easy as it gets, but it’s a hearty meal that feels like Sunday Supper, even on a Monday night! 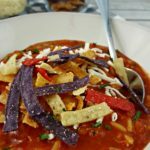 Owning an instant pot has been one of the best investments for my kitchen. Serving supper never got easier with recipes like this pork tenderloin instant pot recipe. I love how easy it is to create a delicious meal for my family in just minutes. Pork tenderloin is high in protein and low in fat. I often choose pork tenderloin because it’s a rich source of Vitamin B as well as zinc & selenium. For people who want to increase protein while lowering fat consumption, this recipe is the perfect option for you. This recipe is SO delicious that it made our Most Popular Recipes of 2018 list! 2 lbs natural pork tenderloin (I used 2 1lb pieces) – PLEASE NOTE – YOU MUST USE PORK TENDERLOIN FOR THIS RECIPE. When a food option is considered rich in nutrients, it must contain at least 20% of the recommended daily allowance. I highly recommend instant pot pork tenderloin as a good choice meat for family meals because it has 22 grams of protein per 3-oz serving, an excellent source for Vitamin B-12 which is not found in plant-based foods, and 2 milligrams of zinc per 3oz serving. When selecting the perfect piece of meat for this meal, be sure to pick a chunk of meat that isn’t pre-seasoned as that will increase the sodium content significantly. You can season your instant pot pork tenderloin with the tips I have within my step-by-step recipe below. So what are you waiting for? Is it about time for supper yet? Gather up the ingredients and follow my step-by-step instructions to create a scrumptious meal for your family this evening. Use saute button for an option to cook something just as you would in a skillet or pan on the stovetop. Use 1/2 cup of liquid in the inner pot when pressure cooking to pressurize the unit. You can use the adjust button to make the preset options hotter or cooler in your instant pot. When opting to use the manual instant pot button plan to cook your instant pot pork tenderloin meal 10-15 minutes longer. Make sure the pressure valve on your instant pot is set to “sealing” when pressure cooking so it can reach appropriate pressure. DO NOT open the instant pot when it’s set in manual or pressure mode after 10 seconds or you’ll get a face full of steam. 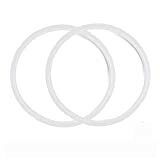 DO NOT forget to purchase a secondary Instant Pot Inner Cooking and sealing ring for your instant pot. Enjoy this delicious but easy Instant Pot Pork Tenderloin Dinner any night of the week! On your instant pot, set the sauté setting to high, then add the olive oil. When the oil is hot, add the finely chopped onions. Season with salt and pepper and fresh thyme. Cover with the standard pot lid and allow the onions to cook until translucent, stirring occasionally. Cook a little longer until the onions are golden brown, then add the chicken stock. 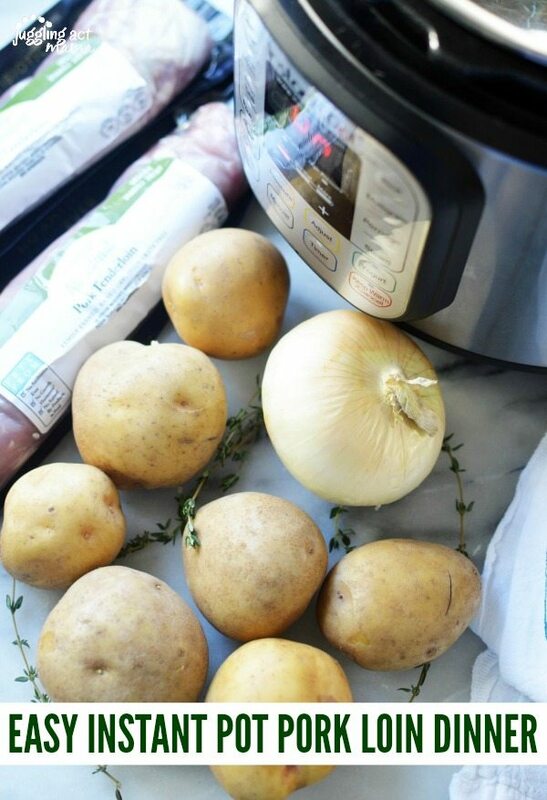 Cut the potatoes in half and place them into the stock in one layer. Place the pork loins on top and season with additional salt, pepper, and thyme. Twist on the locking lid and set the steam valve to sealing and then cancel the sauté setting. Select manual mode for 8 minutes of high pressure. When the Instant Pot beeps, carefully lay a clean cloth over the top of the lid and then release the pressure from the pot manually. Select Cancel to end the cooking time. Remove the meat and potatoes and let rest for a few minutes while you make the quick gravy. Choose the sauté setting on high. Pour the two packets of gravy mix into the cooking liquid still in the pot. Whisk until smooth and cook until the mixture thickens. Be sure turn off the instant pot. Arrange the potatoes and pork on a platter and pour the gravy over the top. Season with fresh thyme, if desired. PLEASE NOTE - YOU MUST USE PORK TENDERLOIN FOR THIS RECIPE. What herbs go well with pork loin? There are quite a few herbs that go well with pork loin. I opted to go with thyme because I think it’s a great mix for this instant pot pork loin recipe. The best herbs to select from when making your own pork loin recipe is dill, garlic, rosemary, sage, fennel, cumin or curry powder. If you’re making this recipe in the fall, it’s great to mix some cloves and apples with pork loin for that seasonal flavor. When you want a little kick, choose cumin or Chile powder to go with your pork loin. Did you slice or quarter the potatoes, or put them in whole? I’m making this tonight, it looks delicious! Oh Tausha! That’s not good! 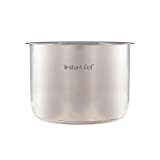 I would check to make sure that the instant pot is totally sealed so that it is able to pressurize and cook the pork through. If the equipment was all working properly, than the issue might have been the size/thickness of the pork loin. Larger pieces would need more cook time. I hope this helps! Please clarify whether this recipe is for a pork TENDERLOIN or a pork LOIN. Both cuts of meat are mentioned in the blog. However, the caption says Pork Loin, but the picture looks like Pork Tenderloin. Thank you. Same issue. We used 2 one pound pieces and the loin came out raw. Pot was definitely sealed. The same thing happened to us. I think because we used a loin, it was to thick for an 8 min cook time. I returned the roast to the pot and cooked an additional 5 min. It was delicious. This was my first attempt with my IP. I’m sure it get easier as you get more familiar. Thx for the recipe. Hi Janet! This recipe is meant to be for tenderloin (versus loin) so may get quicker results with that cut 🙂 I’m glad you enjoyed the flavors! I used pork tenderloin which cooked well. I think a thicker piece needs the time adjusted. I halved the potatoes and they were perfect! I did not use the gravy. We had apple sauce on the side. Thanks for this recipe!! I have made this several times since purchasing my IP in April 2018. It never disapppoints and is delicious. The only thing I do different is I use Pioneer Pork Gravy mix and it is delicious. I have a one (1) lb. tenderloin, would you half the ingredients and/or cooking time? Half the ingredients for sure. As for cooking time, you may have to play around with the amount of time. I haven’t tested with only 1lb. Looks delicious! Can I make this using a frozen pork tenderloin? Ang, Thank you for posting this recipe! It is delicious and so easy! I seasoned the tenderloin with salt, pepper, thyme and garlic powder and browned it a little. I removed the tenderloin and then sauteed the onion before putting everything back in the Instant Pot. Everything was delicious – the potatoes were perfect! This is the first time I’ve tried tenderloin in my Instant Pot and your recipe was perfection! It’s definitely a new “go to” for me! I too used your recipe for the first time ever using a pressure cooker. I don’t have an instant pot I have the Crockpot Insta pot. I was very nervous. 😊 My pork tenderloin was not cooked in the middle. I put it back on to cook and pushed the meat stew setting then lowered the time it had already cooked (8 mins). I see pic of your pork tenderloin it is really skinny. Mine was about twice as big. So we shall see how it comes out. Smells great. Think my potatoes will be mush. Lol. Hubby says we will just mix them into the gravy. I’ve never used the Crockpot Insta Pot. I hope the recipe came out alright for you! I want to try this recipe. I’m wondering if I can add carrots to it? If so, would I add them to the pot with the potatoes and tenderloin and cook them the same about of time or would they turn out mushy? You can add carrots but they’ll cook faster than the potatoes. I’d leave them in larger pieces, then cut them up after they’re cooked. H!! 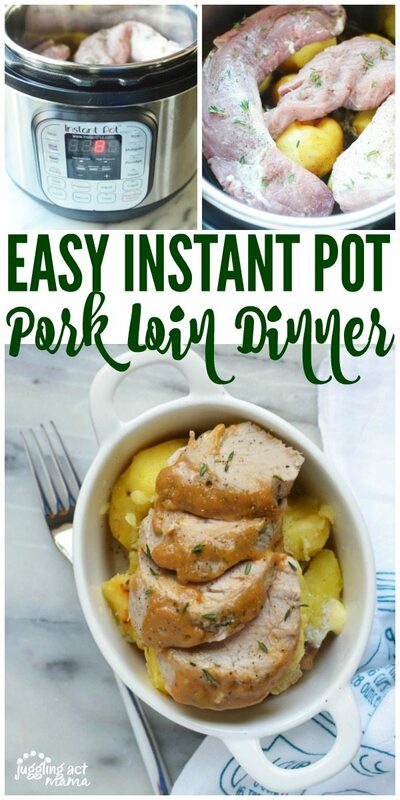 I am looking for a instant pot recipe that asks for pork tenderloin and potatoes. Found this one! Wonder if russet potatoes would work. How much? Cut in big chunks? Same amount of cooking time? Thanks! Made this tonight. It was delish, Halved the recipe as I had a 1 # loin. I departed from the recipe in that I seared the meat first. Then removed and cooked the onions. I also added almost equal portions of peeleled quartered carrots to the potatoes. I used a gravy mix, but liquid was thin. Would thicken in the future with cornstarch. A good crusty bread would be a great accompaniment. Definitely will make again. Thanks! I’m so glad you enjoyed this meal, Colleen! Thank you for taking the time to leave a comment.